PPJ/SHS students join together to help bring a food/clothes pantry to their school. Pictured from left to right are Lexee Wray, Trenton Mayes, Clairy Keefer, Crimson Cochran and Kasey Lyons. POINT PLEASANT — At times, individuals just need a little extra help whether it be for food, clothing, or personal hygiene products and asking for that help is not always easy. Students and staff at Point Pleasant Junior/Senior High School (PPJ/SHS) have a way to discreetly provide students and their families who are in need with necessities. The food/clothes pantry at PPJ/SHS initially began at the start of this year, according to Cheryl Lyons, PPJ/SHS interpreter, when students from her Junior Civitan club were figuring out what to do for their big community service project and decided to create a clothing pantry for students in need at their school. 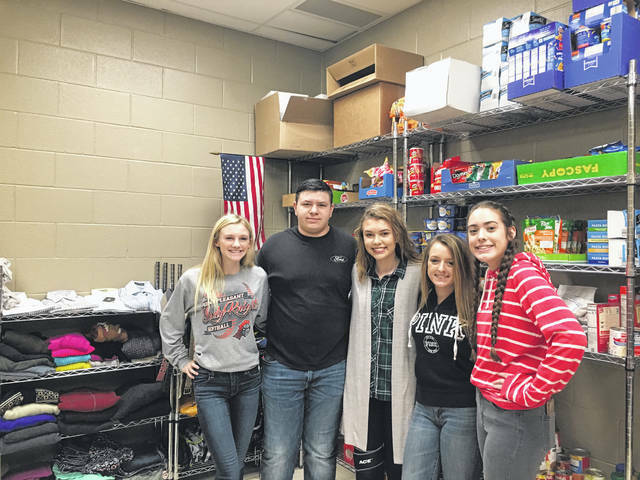 A few months later, four PPJ/SHS sophomores Clairy Keefer, Crimson Cochran, Trenton Mayes, and Lexee Wray began discussing the benefits of having a food pantry at the school and decided to reach out to Principal William Cottrill. “I was thinking about starting a food pantry and I’ve seen students around the school less fortunate than everybody else and I brought the idea to these three girls into a little group chat and we just talked about it and bounced ideas off each other, then I talked to Mr. Cottrill and Mr. Cottrill loved the idea. He actually helped us have a little jump start with money,” said Mayes. Mayes explained Cottrill then brought in Lyons to be the advisor for this project, but since Lyons may be leaving the school in the near future, the students reached out to PPJ/SHS Counselor David Bowers to be their advisor. Food and hygiene products were added to the clothes pantry last fall. Bowers explained Cottrill donated shelves for the food donations and students at the Mason County Career Center are currently working on building additional shelving for the pantry. Bowers, along with Lyons, pay attention to students who may need extra help and reach out their hand to them. Students are also welcome to come and speak with them personally if they are needing assistance. Not only the students, but their families are given necessities for happy, healthy living. “I grew up in a really small school and we all kind of knew each other on a really personal level, I knew a lot of them struggled, so it kind of hit home to me to know that I could be a part of this and help kids out that I grew up with and ones just like them and I know that families around here struggle,” said Keefer. Bowers shared to help with keeping the student’s identity confidential, he, Lyons, and at times another counselor will deliver items to the students’ homes. The pantry even has its own bank account for monetary donations, added Mayes. A surplus of food is donated to the pantry twice a month from local churches, keeping the pantry well stocked with items. Also, many donations come in through the community via local businesses and organizations, 4-H clubs, and individuals. Bowers commented his students are always helping with organizing the items and making records of what they have in stock and noting what they need. Whenever people inquire about making a donation towards the pantry, Bowers is able to tell them what sorts of items the pantry is needing at the time. Lyons added, along with providing students with necessities for their home life, the pantry also provides students with back up clothing should something happen to their outfit during the school day, sneakers and active wear for physical education class, formal wear for school dances, and professional wear for government students or for students going to interviews for colleges or jobs. For those interested in donating to the PPJ/SHS food/clothes pantry, they can contact Bowers at the school and he will inform those donating what the pantry is needing at the time, his email is David.P.Bowers@k12.wv.us. Monetary donations are accepted as well.